my affection towards shakshuka began with this idyllic moment in dahab, egypt. i don't know why i don't make it more often for myself at home. it's stupidly easy to make and incredibly satisfying. last weekend, we went to the farmers market a bit later in the day than usual and our go-to egg farmer was sold out of chicken eggs. he did however, have beautiful giant duck eggs for sale! they were far heftier than chicken eggs, with incredibly rich, large orange yolks that ran runny through the spicy tomato stew. and in celebration of spring, i tossed in some fresh radishes from the market as well and served it all up with some crusty olive fougasse bread from our favorite market vendor. it was such an incredible meal, you can certainly enjoy this dish for breakfast, lunch or dinner! i'd encourage you to splurge on some pastured duck eggs, but you can certainly use chicken eggs. note that they won't be quite as filling so you may want to cook 2 chicken eggs per serving, instead of one duck egg. you can also make a full batch of tomato stew and then just use a portion of the stew to cook individual eggs in individual-sized skillets. 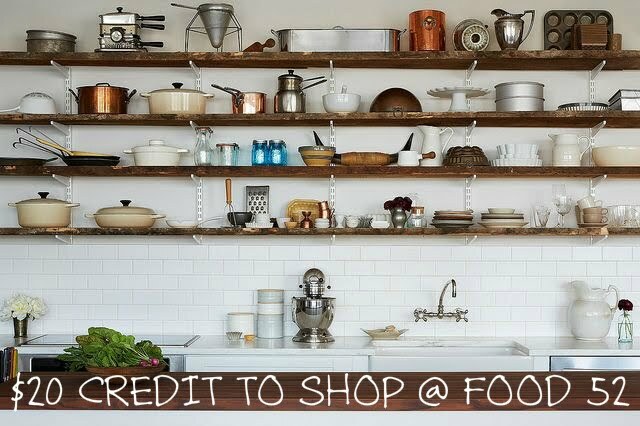 or store any leftover stew and simmer more eggs another day! 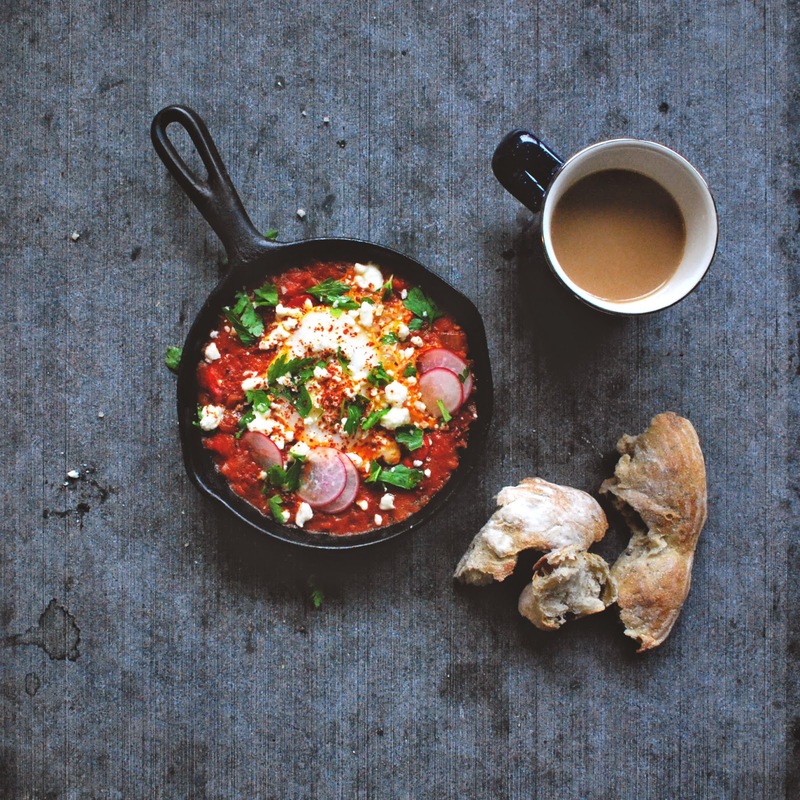 heck, make a double batch of shakshuka stew and have a quick 5 minute meal ready to go all week! serve with crusty bread for mopping up the stewy eggs! notes: cherry bomb peppers are spicy, so if you are sensitive to heat, use red bell pepper. harissa is also optional, but i love the added heat of both the fresh peppers and the harissa chili paste! crush garlic cloves and let rest for 10 minutes before cooking garlic. heat oil in a wide skillet and saute onions over medium heat for 5 minutes. add garlic, peppers and spices. saute for another 3 minutes over medium-low heat. add crushed or blended tomatoes and bring to a simmer. continue to simmer, covered, for 15 minutes. 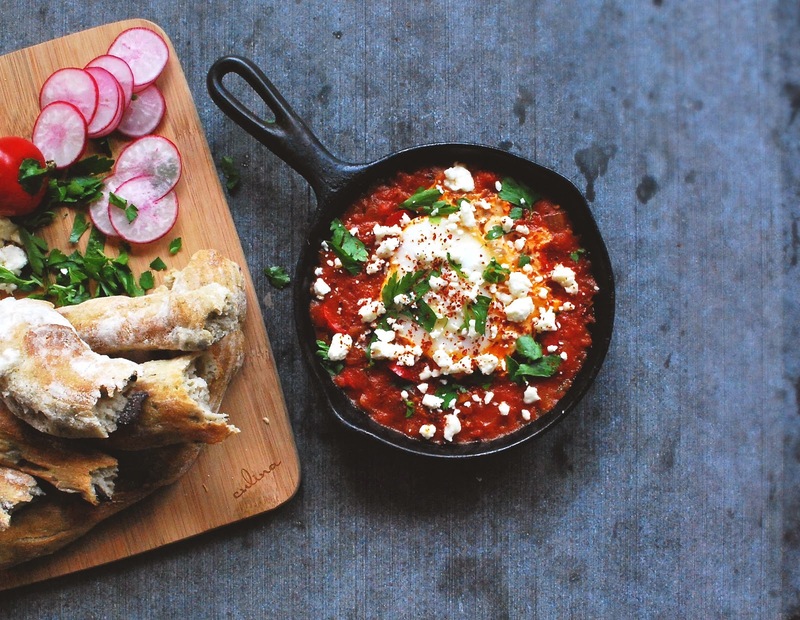 in the mean time wash and chop parsley, thinly slice radishes and crumble feta to set aside. after tomatoes have stewed for 15 minutes, remove lid and make 4 divots in the stew - spaced evenly apart but not too close to the rim. crack duck eggs into each individual divots. cover again and simmer for 5-8 minutes. check firmness frequently after 5 minutes. for duck eggs, you'll want the white to be fairly firm but the yolk should still feel giggly. for chicken eggs, remove from heat when whites are just set. top with parsley, feta cheese and radishes and serve with crusty bread or toast. warm sunshine and springing the clocks ahead an hour this past weekend got me all giddy for springtime! it has inspired some lovely sunny afternoon walks, the creation of all new seasonal menu offerings on kitchen surfing, and a burst of spring cleaning projects at home. it's been a very productive few days, and it's not even technically spring yet... on our latest trip to farmers market, we hauled home tons of root vegetables and winter greens, and a small bunch of radishes - the first little inkling that spring veggies are on their way! i'm bubbling with anticipation for asparagus season, when i can swap my daily routine of kale and eggs for asparagus toast. i'm equally excited for artichoke. there's usually a couple of months each spring when i steam artichoke on a near nightly basis, lapping up leaves dipped in my favorite vinaigrette, and fighting over the artichoke hearts with david. 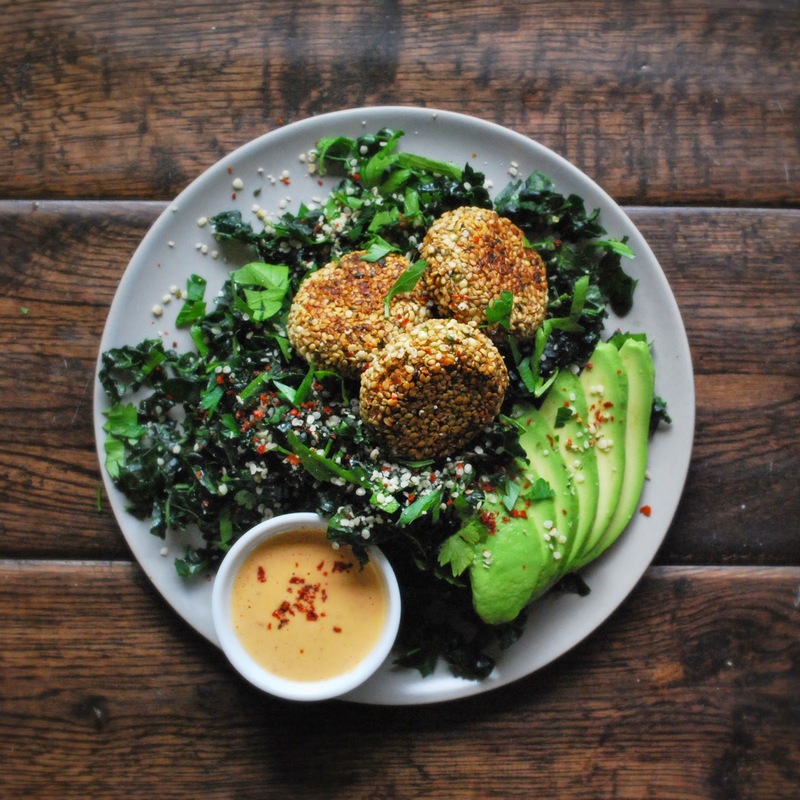 until then, my meals tend to revolve around kale, root vegetables and pantry staples like grains, nuts and seeds. this particular recipe, inspired by a post from sarah wilson, incorporates one of my new favorite superfoods... hemp seeds! these little jems are packed with protein, omega-3s and vitamin e. i'll use them in smoothies, sprinkled on top of salads or mixed into raw energy balls. experimenting with them today in falafel was a huge success! the addition of fresh parsley, shallot and lemon brightened the flavors of these seed & nut based falafel. 2 tablespoons toasted sesame seeds, raw works ok too! preheat oven to 425-degrees. line a baking sheet with foil and grease foil with 1 tablespoon of olive oil. set aside. combine cashews, shallots, garlic and parsley in a food processor and pulse until finely chopped. add 1/2 cup hemp seeds, lemon juice, zest and salt and processor until combined. transfer mixture to a mixing bowl and stir any unincorporated bits. the mixture will be sticky, so wet your hands a bit to keep the mixture from sticking to your palms as you form a heaping tablespoon into a ball. don't worry about shape too much, just try to create evenly sized falafel. in a clean bowl, stir together 2 tablespoons of hemp seeds with 2 tablespoons sesame seeds. 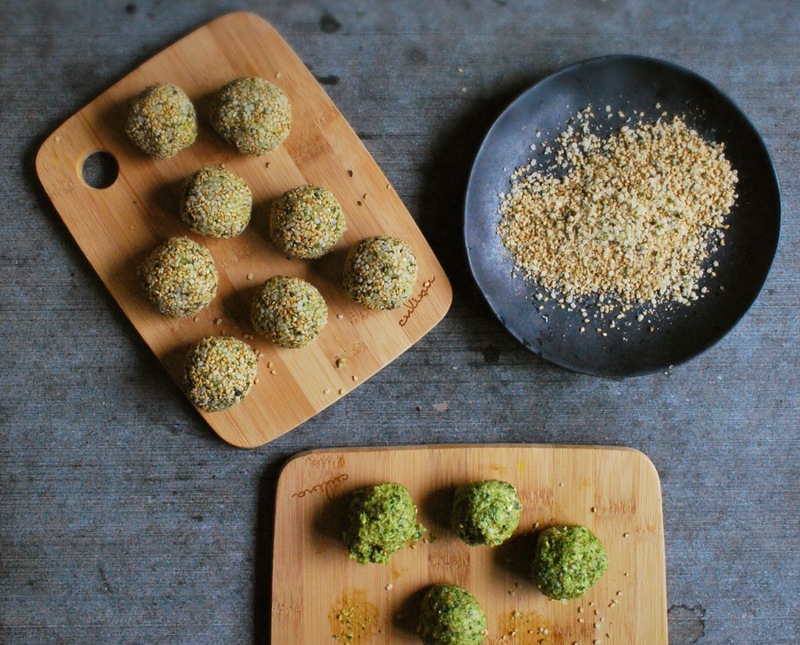 one at a time, roll the falafel balls in the seeds until coated. 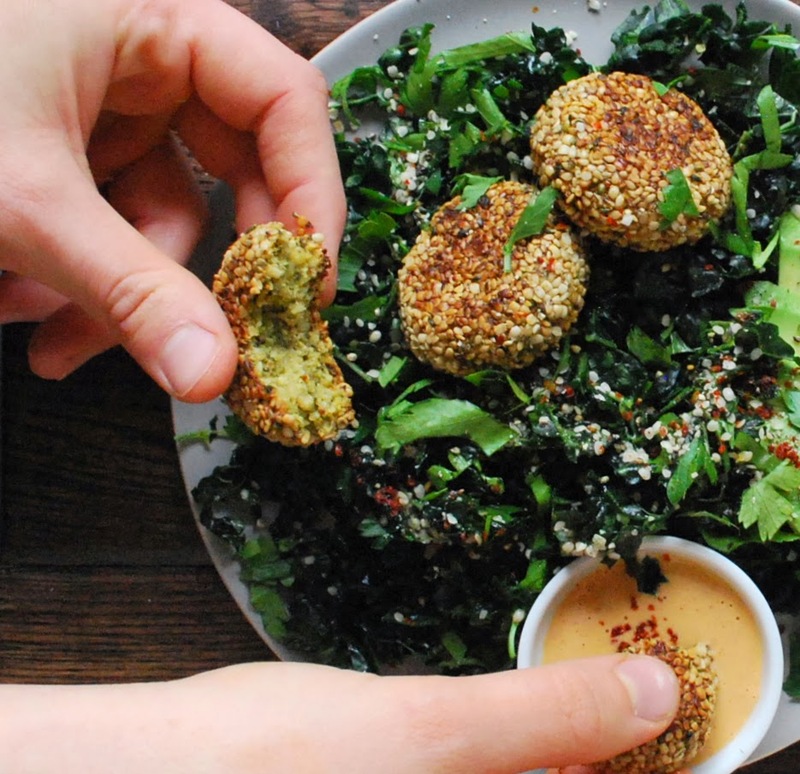 once you've coated them all, wash and dry your hands then roll the coated falafel in your palms to reform perfect little balls and place them on the prepared baking sheet. you can leave them round, or gently flatten them a bit. bake for 10 minutes, flip and then bake for another 7-10 minutes until falafel are nicely browned on both sides. serve warm! massage prepped chopped kale with oil, lemon juice and sea salt until evenly coated and slightly wilted. 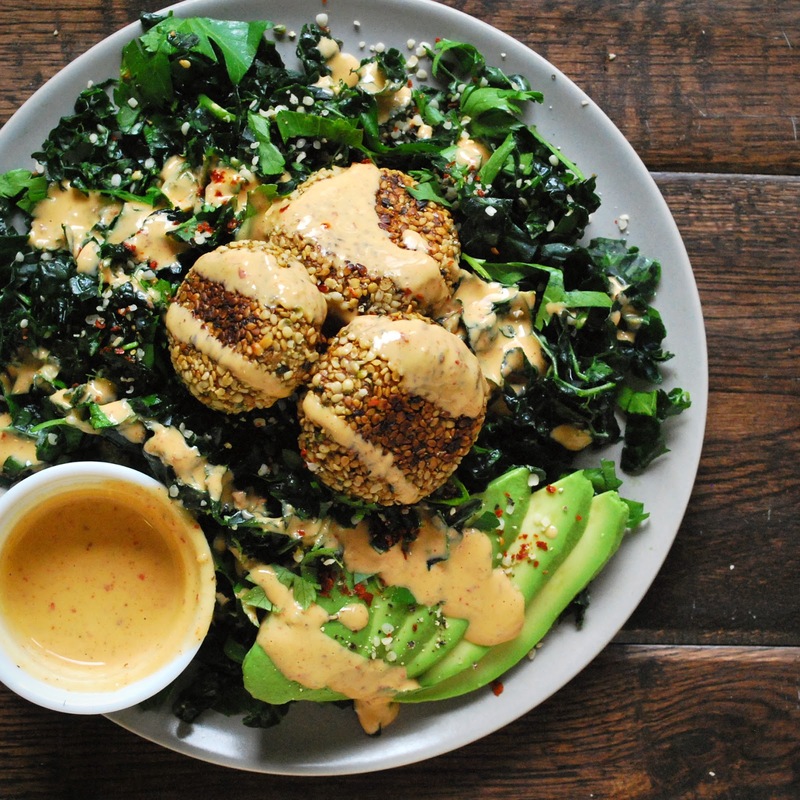 sprinkle with hemp seeds and top with warm baked falafel, sliced rice avocado & harissa-tahini dressing (see recipe below). combine all ingredients in a bowl and whisk until smooth. add just enough warm so that tahini sauce is pourable. adjust spiciness to taste. i used about 1 teaspoon of harissa paste, but i have a high tolerance to spicy heat!